Sugarmill Woods Civic Association, Homosassa Florida. Located on 2,000 acres in Citrus County Florida, Sugarmill Woods is the first Deed Restricted community in the United States that was designed on the concept that every home would be built on a greenbelt or golf course. 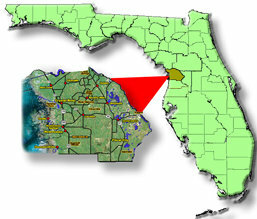 Our rural community is bordered on the east by the Withlacoochee State Forest and on the west by the Gulf of Mexico. With a current population of 9,000 people, it is comprised of three "village" neighborhoods with 4,200 homes and approximately 4,000 site-ready lots available to build on. It has to be seen to be appreciated. Within Cypress Village are 27 holes of golf at the private Sugarmill Woods Country Club. In addition to single family homes, Cypress Village offers maintenance-free villas, condominiums and apartment complexes designed to meet the needs of part-time residents and full-time retirees with active lifestyles. Oak Village features single family homes with dedicated greenbelt areas. The Golf Club's Recreation and Tennis Center is located in Oak Village. Southern Woods hosts the champion 18-hole, Hale Irwin-designed, semi-private Southern Woods Golf Club. This village includes single family homes with the majority of home sites in Southern Woods on a golf course lot. With low annual property owner fees, Sugarmill Woods’ contemporary homes offer the best home-buying values in the State of Florida. Although Sugarmill Woods is not exclusively a retirement community, it has historically attracted retirees from all over the US and 19 foreign countries. By word of mouth or internet search, they have discovered the rural quietness, low crime, low tax, peaceful security and affordability of Sugarmill Woods. The affordability and quality of homes in Sugarmill Woods are also becoming increasingly attractive to younger families. There are more than 500 children living in Sugarmill Woods attending Citrus County's highly-rated schools. There are three fully-staffed hospitals within 20 to 25 minutes serving the community. The Lecanto medical corridor offers centrally located specialty practices serving all of Citrus County. An Assisted Living and Memory Care Center with independent living cottages is planned to be located between the Cypress and Oak Villages. 60 minutes north of Tampa Bay and 90 minutes northwest of Orlando's many attractions, residents have easy access to urban sports, entertainment, shopping, dining and cultural venues. Within 10 to 30 minutes, Sugarmill Woods residents can be fishing on one of the world famous first magnitude spring fed Seven Rivers of the Nature Coast. Nearby is Gulf Coast ocean fishing for trophy tarpon and cobia. Enjoy the many annual seafood, music, art and dragon boat festivals held in Citrus County. The best manatee watching in Florida is at the acclaimed Homosassa Springs Wildlife Park or the spectacular Three Sisters Springs. The 46-mile-long Withlacoochee Bike Trail is attracting riders from all over the state and it is only a short drive away from Sugarmill Woods. Sugarmill Woods offers the best of many worlds...a rural lifestyle and recreational pleasures near urban amenities. It is what Florida used to be before urban sprawl covered much of the state. Come see a Florida you did not know still existed. Come live the good life in Sugarmill Woods. For more information about Sugarmill Woods, our villages and our area attractions, please check the links in our website.